Egyptian Bazaar : An exotic food market and bazaar, selling spices , dried fruits, cheeses, olives, as well as towels, slippers, baskets and some jewelry. Bosphorus Cruise : Passing through palaces of Ottoman, Dolmabahce and Beylerbeyi, ancient wooden houses , modern villas to the opening of the Black Sea. Dolmabahce Palace : The last residence for Ottoman Sultans with 365 rooms and 22 saloons. Famous with the great collection of European antiquity, furniture and 4.5 tons chandelier. 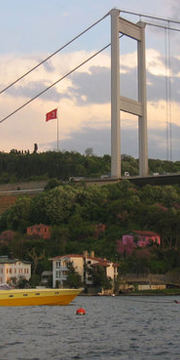 Bosporus Bridge : A drive to the Asian part of Istanbul crossing the Intercontinental Bosphorus bridge. Camlica Hill : The highest point where you can overlook Istanbul and take nice pictures.